That’s what used to go through my mind every time I looked up at Vulcan, the towering cast iron figure looming over the city of Birmingham from the top of Red Mountain. I mean, what the heck happened here? His head is too big, his proportions are odd, --and what is he doing!? Is he reaching out to hand that spear to someone? What?!! 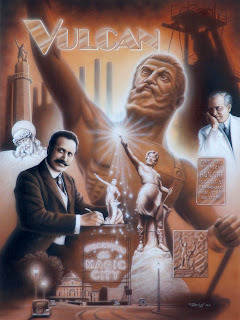 Certainly, Vulcan, as Ironsmith to the Gods, was an excellent choice to represent Birmingham. A perfect symbol at least, for the Birmingham at the turn of the previous century, when the city it was a major engine of the Industrial Age. The natural occurrence of iron ore, coal, and limestone, not to mention the unmentionable, the source of poor cheap labor, made Birmingham a powerhouse. 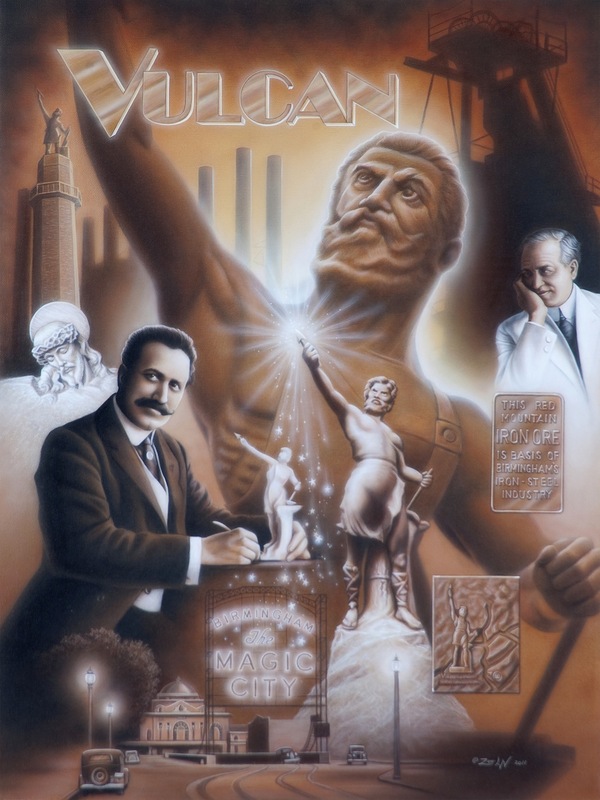 I also learned heard the history of Vulcan’s trek to the 1904 St Louis World Fair, where he was celebrated heroically, and then returned home, to Birmingham, . . . to silence, disinterest, and confusion as to where he belonged. From medal-winning prize to hot potato in one train ride. A long way from champagne toasts in Missouri, he wound up back home dumped off the train as unclaimed, unpaid, freight, eventually winding up mis-assembled at the local Fairgrounds, where for years he was used as an advertising prop. And when he finally got put up on Red Mountain (1935), his spear was exchanged for a night light, and he was used like a traffic accident update: Green for Good, red for Bad news. And then there were the various failed attempts at improvement that wound up threatening his very existence. A little knowledge is a dangerous thing: No one thought through the idea of filling him up with concrete, so with time—and temperature and humidity, Vulcan truly, literally, was coming apart at the seams. Still, Vulcan is cherished here, despite his less than perfect proportions. In contrast, the preliminary model of Vulcan is beautiful, and displays subtlety and nuance. The maquette is lovely, showing a powerful and attractive man, back arched, lifting the spear high above his head to see if it’s point is hammered true. And after viewing Moretti’s other work, including “Head of Christ” (which is as subtle a piece of marble portraiture and as delicately done as Vulcan is –not), I just couldn’t make sense of it. A few of those other pieces by Moretti are here in Birmingham, and Pittsburgh is rife with them: he was commissioned to design an entire park there, as well as a number of public monuments. Other large commissions are scattered throughout the US in places like Tennessee and Ohio. And in Cuba, the Gran Teatro de la Habana is adorned with 4 of his large sculpture groups and an angel who stands at its pinnacle. After researching these other samples of his work, I can only affirm the obvious: Moretti was an exquisite sculptor. The delicacy of his technique demonstrated in his Head of Christ runs throughout his work. Which still left me mystified. It’s not that Vulcan’s a bad piece of sculpture, it just has its peculiarities-- but why, when others by Moretti are so perfect? Why the discrepancy? It’s obviously not a lack of talent or inspiration. So . . . O.K., they did get somebody good, but what happened that the big guy on the mountain looks the way he does? Time, I think it was a factor of time. Moretti had a deadline of six months: six months to go from rolling a ball of clay in his Bronx studio in December, to erecting a 56-foot tall cast iron giant in St Louis by June. Moretti had to create an original 3D design, about 18 inches tall, (the maquette mentioned above), have it approved, then enlarge it to 12 feet tall, then enlarge it again to full size, all in clay. I can’t imagine working with that much cold wet clay in the chill of late winter. He had 16 assistants, so it was probably a shared misery, even though they had to be driven with the excitement of attempting the impossible. Their success would be on display at the upcoming World’s Fair, for all the world to see. Vulcan would be the largest sculpture of it’s kind. (It still is). Success would be as large and as solid as Vulcan himself. Even failure would make a good story for their grandkids. To fit all 56 feet of the final Vulcan into his (apparently tall) studio required splitting him in half: head to waist, and waist to feet. This split might also have caused the error in proportion. Artists do use math, much more than the general public would believe. But even with the figures checked twice, we go by eyeball to make the final proof. And even if Moretti suspected something was off, there was no time to make any significant changes. The final clay model was divided into even more pieces so that plaster molds could be made and shipped to Sloss Furnace where the once clay giant would become iron. Regarding the shift of the figure’s balance from the maquette to the final Vulcan, giving him that “here, take this” pose? One reference I came across mentions a large amount of clay slipping off Vulcan’s arched back: maybe this is when the figure was pitched a little more forward to compensate. Maybe they were afraid the statue, once cast in metal, would fall backward. A friend of mine, an engineer, pointed out a difference from the maquette’s base to the base of the final Vulcan: there’s less mass. Maybe they had to pitch him forward to compensate for the lack of ballast. Again, they’d be afraid he’d fall backward. I have no idea if I’m the least bit correct in my suppositions, but seems that the confluence of issues: the tight time-frame, (mis? )-calculations in enlargement, surprises with the clay, and the need to preserve the statue’s center of gravity is this artist’s best guess as to why Vulcan is the way he is. My 10-gallon hat is off to Guiseppi Moretti--and to his Vulcan, a triumph of the artist up against a deadline. The man I first set out to criticize has made me a believer --years after his death. Now I want to go and find his place out in Sylacauga, where he once lived, had a studio --and a quarry. Moretti loved the marble from Sylacauga; he found it to be superior to any from Italy. He pulled the rock which became “the Head of Christ” out of the ‘Bama hillside himself. He apparently carved a marble slab 9 feet long and a mere1½ inches thick to demonstrate the material’s strength and translucence. Three times he put together a marble production business, which three times, fell prey to the irregularities of the economy. Moretti’s commissions took him back to New York, to Cuba, and eventually back to Italy. “Vulcan” was an achievement, but during his lifetime, under-appreciated. The statue didn’t make it up onto Red Mountain until the year of Moretti’s death. If he could see the park and museum now, I’m sure he would be gratified. I’ve never seen a sign out there pointing to his studio, and it’s not on their tourist map, but I hope the Sylacauga Chamber of Commerce knows where to find it. There should be tours honoring the name and talent of this gifted artist.